Cam's Cinematic Episodes: Film Review - DEPARTURES: A Life-Affirming Story With Some Deadly Cliches. Film Review - DEPARTURES: A Life-Affirming Story With Some Deadly Cliches. A considerable swirl of debate surrounded Departures last February when, to the surprise of many, the Japanese film snatched up the Best Foreign Film prize at the 2009 Academy Awards. Beating out hipper, edgier fare such as France’s The Class and Israel’s Waltz With Bashir, the film’s triumph was viewed with a mix of contrasting opinions. While many saw Departures’ win as further evidence of the committee’s preference for unabashedly sentimental films over bold medium-challenging accomplishments, others championed the picture as being a transfixing work of meditative splendour, subtly poetic and achingly beautiful. Well, after finally viewing the film – no thanks to an unfortunately sluggish release schedu le – I find myself tap-dancing somewhere in the middle. On one hand, acclaimed director Yojiro Takita has crafted an often enchanting and compelling character-driven exploration into mankind’s uneasy relationship with death. However, on the flip side, he has also made an often shamelessly manipulative tear-jerker. 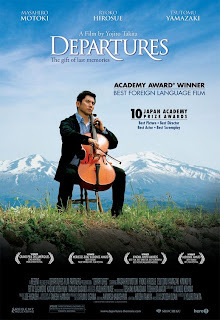 The movie stars Masahiro Motoki as Daigo Kobayashi, a visibly troubled young cellist forced to leave the comfortable urban jungle of Tokyo after his orche stra is dissolved due to lack of interest. Low on finances and suffering an identity crisis, Daigo, along with his loving wife Mika (Ryoko Hirosue), moves back to his small hometown of Yagamata, taking up residence in his deceased mother’s ramshackle house. Eager for employment, and under the mistaken impression that he is applying at a travel agency, the anxious young man unwittingly winds up being hired as an NK Agent, or “encoffineer”, under the tutelage of the weary, laconic Ikuei Sasaki (Tsutomu Yamazaki). Daigo’s new job consists of retrieving dead bodies from their points of expiration and then performing the traditional funereal ceremony in which bodies are prepared f or their entrance into the next phase of life. After a bumpy start involving a much-decayed corpse collection case, Daigo proves himself to be a born natural, presiding over a series of elegant, bittersweet memorial services, and gradually discovering his own sense of inner-peace. But when the truth of his publicly frowned-upon occupation becomes known within the small community, alienating many of his closest friends and relations, the conflicted former-cellist must examine his own feelings towards his new vocation as well as his long-lingering resentments towards the father who abandoned him as a child. Now, I’m a sucker for any movie that shows me something I’ve never seen before, and Departures’ “en coffineering” scenes are truly astonishing to behold. Graceful and delicate, these moments, which detail the process wherein the deceased are bathed, dressed and made-up, are powerfully captivating and choreographed by director Yojiro Takita like individual dance routines, each one with its own feel, rhythm and emotional undertone. Fortunately the living actors also provide the journey with its own share of rewards. Motoki, as the conflicted protagonist, is so earnestly heartfelt that we feel personally invested in his own emotional quest. Despite the odd moment of goofy muggin g from the actor, he really manages to reveal the buried hurt and conflicting thoughts of his character without making him into an overly melancholy man-child. The father/son dynamic he shares with the quietly commanding Yamazuki - whose low-key style yields the film’s richest, most stunningly layered performance - gives the film a captivatingly vibrant pulse. In one of many particularly remarkable scenes – almost a mini-movie unto itself - the two men share a meal and quiet conversation in a small indoor garden, allowing their characters to breath and simply exist, sincere and unguarded, in the moment. If only Departures had remained focused on capturing authentically honest human relationships it could have really added up to something extraordinary. Sadly though, in its meandering latter half it too often stoops to relying on musty clichés and g roaning implausibilities to reach its insipidly syrupy ending. One of the biggest offences is against Hirosue as Daigo’s wife, one of the film’s most radiant presences who, for the sake of creating conflict, behaves in ways that seem at diametrical odds with her sunny, open-minded personality. Equally damaging is the script’s decision to stage not one, but TWO draggy climactic funerals, packed with “Important Revelation”-revealing peripheral characters and a nonstop barrage of ham-fisted symbolism and teary-eyed close-ups, all set to an absurdly treacly score. It’s as if Takita lost confidence in his otherwise restrained film and felt compelled to pander to the audience when it really wasn’t necessary or appropriate. Although the film's considerable problems prevent it from being a completel y successful endeavour, it still contains enough uniquely touching insights into the human condition – namely our fears of mortality and need for love and acceptance – to humbly warrant a visit. Sometimes it takes a long, hard glimpse into the inevitability of death to make life feel that much more exhilarating. In the end Daigo discovers this truth and, when Departures is working, so do we. *Originally Printed in SFU's The Peak: June 22nd, 2009.